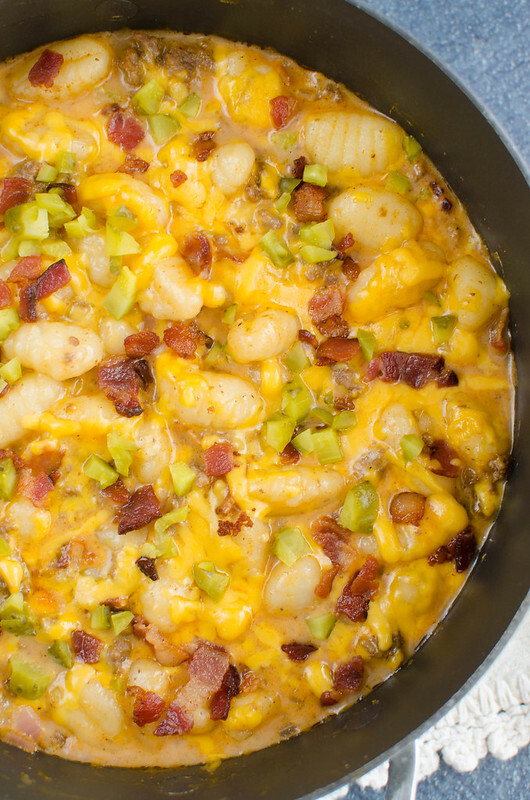 Bacon Cheeseburger Gnocchi – easy 30 minute meal! 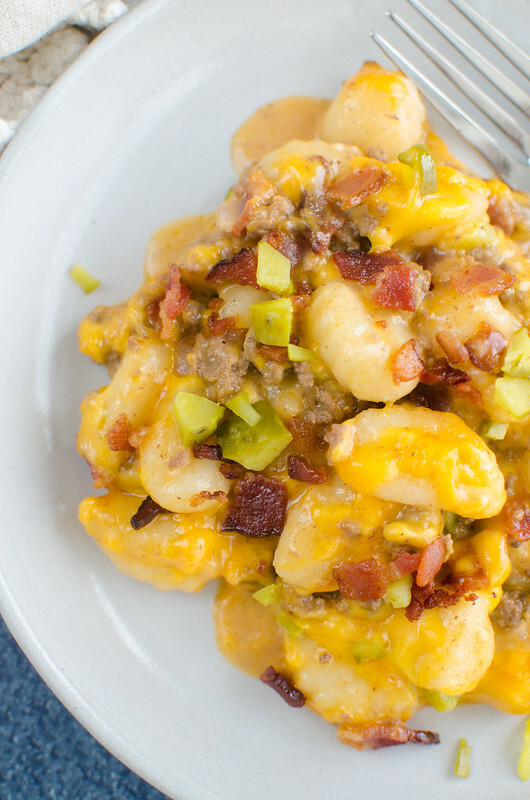 Gnocchi with everything you love about a bacon cheeseburger! Definitely a kid favorite! I’ve put pickles on something you’re not supposed to put pickles on again. But listen, I’m having this thing with burgers right now. I took my kids to In-n-Out for our Christmas Eve dinner – did I tell you guys that? 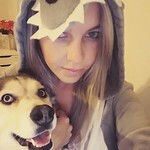 We defininitely had animal fries and double doubles in between making cookies for Santa. And I’ve been thinking about burgers since then but, you know, New Years resolutions or whatever. So going into this long weekend I told myself I’d get In-n-Out by myself on Tuesday if I was good the entire weekend and then you know what happened yesterday? It didn’t snow. It was 19 degrees and I’m happy I didn’t have to go anywhere but I either needed snow or a burger in my life. Maybe today if it warms up enough for me to leave the house. I never make gnocchi and I don’t know why. 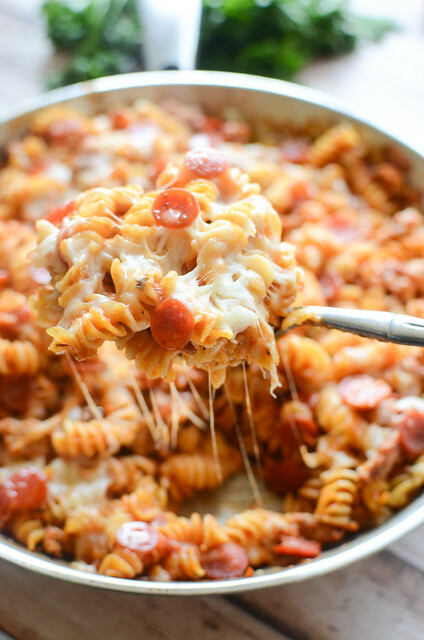 It’s fairly cheap (especially if you buy it in the pasta aisle instead of the refrigerated section), it cooks in literally 2 minutes, and it’s really freakin’ delicious. This was like little potato pillows covered in bacon cheeseburger goodness. Like I said, the gnocchi cooks in 2 minutes and then all you have to do is brown some ground beef, onions, and garlic. Then make a cheesy creamy sauce and stir in some bacon. Broil it until all the cheese melts and top it with chopped pickles. I know that it sounds weird but my kids love this. Like, so much that next time I make it, I’ll probaby double it. If you have any gnocchi recipes that you love, please leave them in the comments! I’m definitely going to start cooking with it more as we get busier in the spring. In a separate skillet, heat olive oil over meidum-high heat. Add ground beef and onion and cook, breaking up the beef, until onion is translucent and beef is cooked through. Add garlic and cook until fragrant, about 30 seconds. Stir in ketchup, mustard, salt, pepper, water, and heavy cream. Bring to a simmer and let cook until thickened. Remove from heat and stir in 1 cup cheese and half of the bacon. Sprinkle the rest of the cheese on top. Broil until cheese is melted, just a minute or 2. Sprinkle with the rest of the bacon and the pickles before serving. 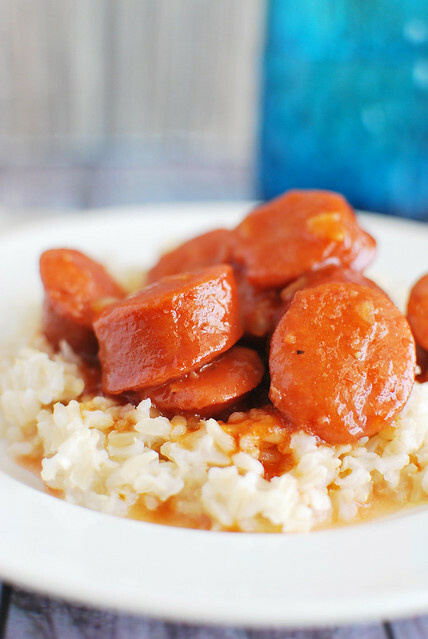 Want more easy weeknight meals? 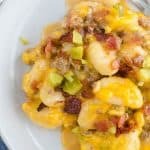 2 Responses to "Bacon Cheeseburger Gnocchi"
Perfect composition of flavours ! :-)Thank you ! 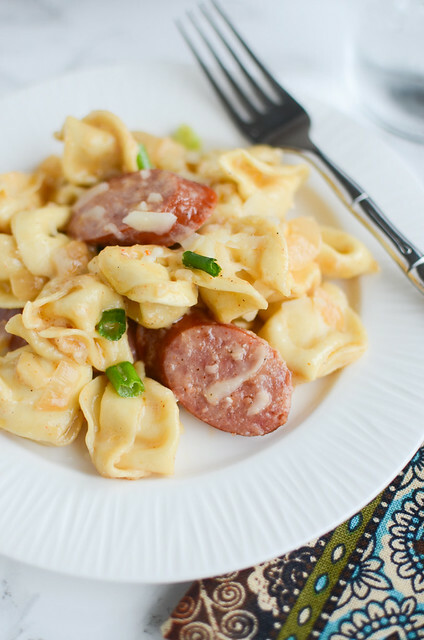 I’m making this for dinner tonight… so excited. I’m assuming you introduce the gnocchi back into the skillet once the ground beef is browned – OR wait until everything has thickened?